Last week, I posted a versatile, all-purpose duxelles recipe for the Monday Meal. This week, we'll put those duxelles to use with a tasty recipe for duxelles-stuffed chile peppers. 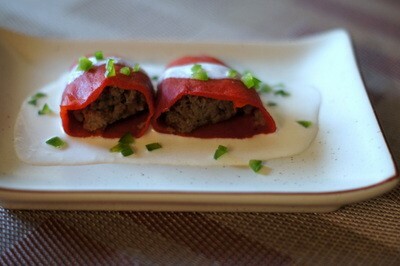 --- For my duxelles recipe, click here. Years ago, I tasted a delicious appetizer at Sundance's Tree Room restaurant: Anaheim chile peppers stuffed with duxelles and served with a creamy sauce. I loved that dish so much that I decided to try to recreate it at home. This is a pretty good version. I've used both Anaheim peppers and piquillo peppers and tend to prefer the latter. You could also use poblano or pasilla peppers. And, you can use either fresh peppers (peeled and seeded) or canned/bottled ones, like I did here -- your choice. 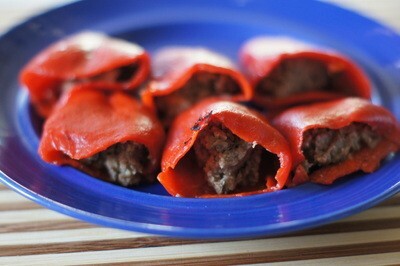 This recipe makes 5-6 stuffed piquillos, perfect for an appetizer. If you'd like to make this for a main dish, just increase the amounts accordingly. 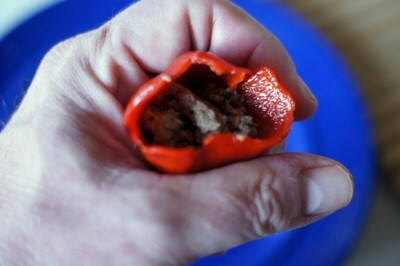 First, use a spoon to stuff each pepper with a couple of tablespoons of duxelles. Set aside on a plate. 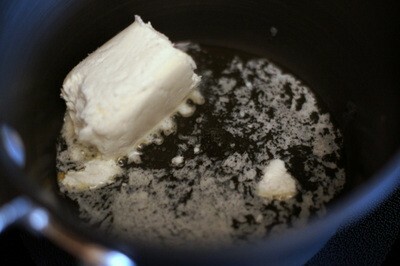 In a small saucepan, melt 1 Tbs. 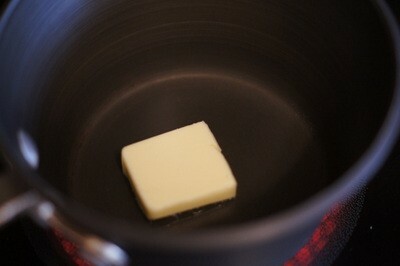 butter over medium-low heat. 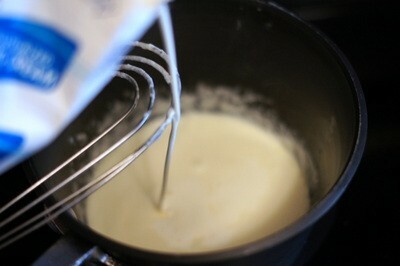 Add the goat cheese and slowly whisk to melt over medium-low heat. When the cheese has completely melted, add cream, a tablespoon or so at a time, until you have the consistency of a thick gravy. 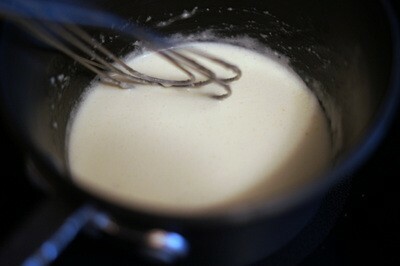 If the gravy is too thick, add a little more cream. 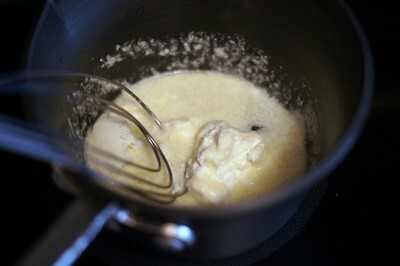 Continue stirring and whisking the sauce until heated through -- hot, but not boiling. 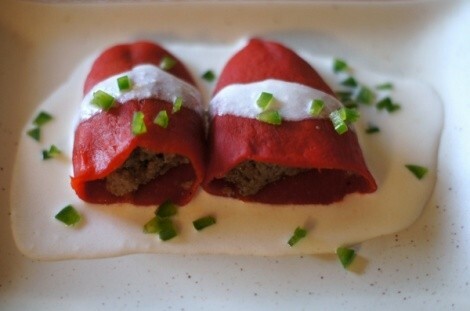 The duxelles-stuffed piquillos can be served at room temperature, or you could either heat them briefly in the oven or warm them in a microwave. 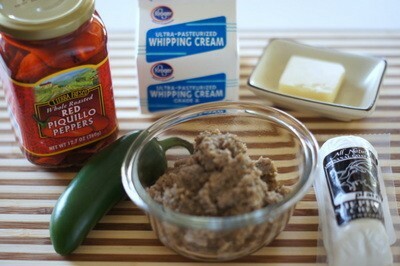 When ready to serve, pour the sauce over the peppers and garnish with minced jalapenos. A good wine accompaniment for this dish is crisp Sauvignon Blanc.